We can’t compete with Rihanna and One Direction, say the Pet Shop Boys. They’re proper pop stars. So how do they explain 50 million record sales and 30 years at the top? 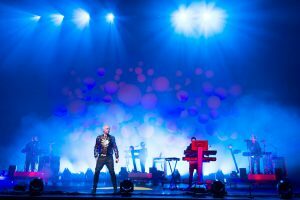 In a dim corner of an east London private members’ club, Pet Shop Boys – Neil Tennant and Chris Lowe – are expounding their philosophy on success. It’s something they know a lot about. The duo have survived three decades in the music industry, making millions from hits like It’s A Sin and What Have I Done To Deserve This?, and cleverly aligning themselves with the most relevant artists of each generation – from Madonna to Robbie Williams, Suede to Bowie, The Killers to Lady Gaga. Given all this, their take comes as a refreshing surprise. ‘The thing about success,’ says Tennant, ‘is you don’t have to confuse it with fame and celebrity. They are here to talk about Electric, their 12th album, supported by a new tour. Given the option, Lowe admits, he’d rather be hiding at home watching Grand Designs (he studied architecture) or daytime TV. This, of course, has to be rubbish. He’s hung out with Liza Minnelli, Yoko Ono and Gaga. Pet Shop Boys have sailed through 30-odd years of pop, constantly evolving their sound, brand and artistic portfolio. They’ve sold over 50 million records, bagged six Grammy nominations, three Brits, three Ivor Novellos (Tennant keeps these in his downstairs loo), and a theatre award for a ballet they scored (The Most Incredible Thing). Tennant made the decision to come out as gay in 1994, whereas Lowe has never bothered. The group were once highly political. Between 1997 and 2001 Tennant regularly donated thousands to the Labour Party. Things have changed, though. Asked for his opinion on Cameron or Miliband, Tennant shrugs. ‘I used to feel that a political party represented what I felt, but I don’t feel that any more. The duo have a fascination with larger-than-life superstars – like Lady Gaga and Elton John – and music legends such as Liza Minnelli and Dusty Springfield. In 1986, they tracked down Springfield and asked her to sing on What Have I Done To Deserve This? At the time, she was in her late forties, broke and living in a motel. ‘There was a huge amount of hostility when we said we wanted to work with her,’ says Tennant. They were proved right. The song went on to reach No 2 in the UK and the U.S. When Tennant, a former music journalist, speaks on the subject of pop, it’s with an analytical, academic slant. ‘I think we admire in others what we know we couldn’t or wouldn’t do ourselves. The duo are like a pop version of Gilbert and George. Tennant, 58, is more gossipy, more ebullient. Lowe, 53, is quieter and more reluctant. He deadpans, Tennant muses and parries. Both middle-class boys who went to good schools (Lowe is from Lancashire, Tennant from Newcastle), neither of them expected a career in the music industry. They met in a hi-fi shop on the King’s Road and started writing songs together in Tennant’s flat. When Tennant was sent – by pop magazine Smash Hits – to interview The Police in New York in 1983, he took a demo tape to producer Bobby Orlando. The following year West End Girls was released in the U.S., becoming a club hit. It eventually reached No 1 in the UK. The duo stood side by side on Top Of The Pops, poker-faced, not even trying to look like pop stars (on the cover of Actually, Tennant is yawning). Thirty years later Pet Shop Boys remain thoroughly British observers of life. In their heads, they’re not stars – but as Lowe says, they’re ‘very happy, very lucky to keep doing what we do.